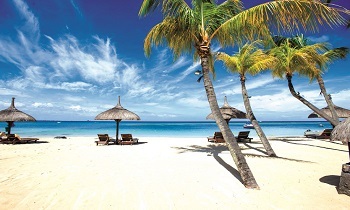 Also known with the name “the pearl island”, Phu Quoc island is truly an invaluable natural treasure. 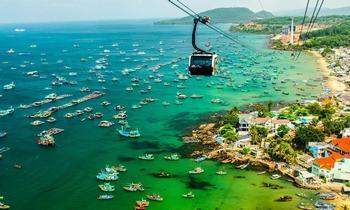 With the infinite tourism potential, Phu Quoc has increasingly attracted more and more visitors. 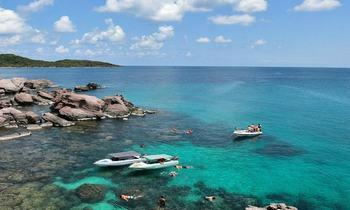 Here is the list of the most attractive destinations in Phu Quoc, which you may want to know. 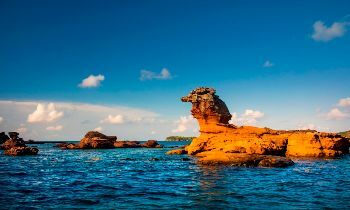 Taking up more than half of the Pearl Island's Northern region, Phu Quoc National Park is an ideal place for adventurous travelers to pursue a wide range of outdoor activities during their tropical vacation. 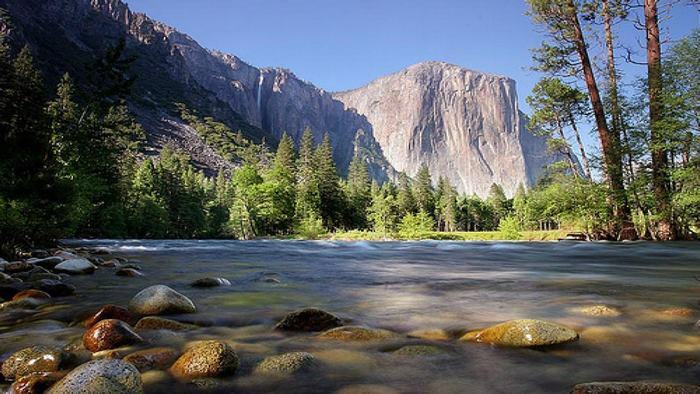 Recognized as UNESCO Biosphere Reserve in 2010, a part of this park is opened to exciting activities such as camping, bird-watching, hiking, and photography. This massive verdant landscape is over 314,000 square meters in size, including the system of unique flora and fauna, greenish forest, and the dense mountain ranges. Although the majority of the reserve is strictly guaranteed by the Vietnamese government to serve for research purposes, tourists can go to the Primitive Forest Reserve through Ganh Dau Village since this zone is accessible for the outdoor pursuits. The park is also the home to several rare wildlife such as silver langurs, long-tailed macaques, slow lories, hornbills, otters, which will surely excite the nature lovers. If you like to challenge your endurance, it's a good idea to decide the four-hour trek in Mount Chua that is the highest peak in the national park, standing at 600 meters above sea level, through the evergreen jungle followed by a 10 meter-tall bamboo ladder. Visiting Phu Quoc National Park is truly a great opportunity to get away from the hustle and bustle of modern life and get back to nature fully. Considered to be a bleak reminder of Vietnam’s heart-rending but valiant past, Phu Quoc prison (also called Cay Dua prison) is the place where thousands of people used to be imprisoned and tortured throughout the Vietnam War. Nowadays, this war museum features torture instruments, pictures of former prisoners and exhibits of cruel punishments. Established in 1949 by French colonists, this prison is asserted to detain more than 40,000 Vietnamese soldiers as well as politicians who opposed to both French and American colonial administrations. In 1995, the prison was recognized as a national historical site and started to be open to the public by the Vietnamese government. In the two-storey exhibition center, there are numerous life-sized wax mannequins simulating scenes of torture, including crucifixion, starvation, and electrocution. Another prominent zone in the prison is the rows of tiger cages. Detainees were kept in absolute darkness and suffered the extreme heat and cold for a long time, causing them to have pneumonia and blindness. Phu Quoc prison is believed to be the most iconic landmarks in the pearl island, attracting a large volume of visitors coming to learn more about Vietnam’s history. 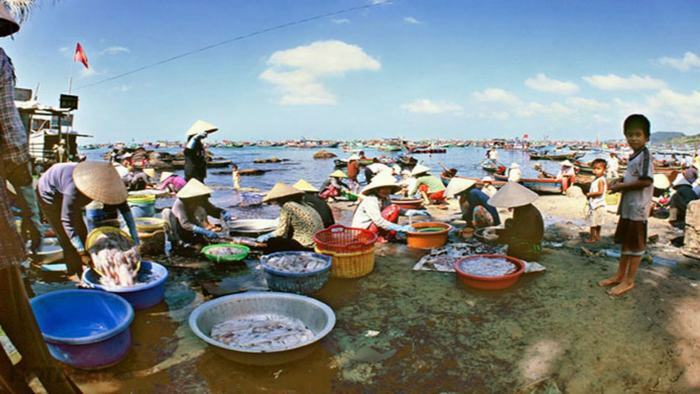 Ham Ninh Fishing Village is an ideal spot for tourists to experience the daily lives of local fishermen as well as the authentic specialties with affordable prices. 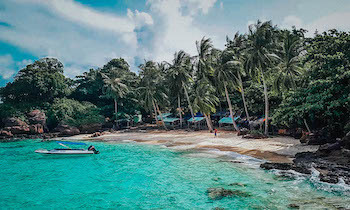 Being one of the most ancient villages on Phu Quoc Island, this fishing village is the location of the main sources of the local's income with jobs such as diving for pearls and catching seafood. Bai Vong Port is a nearby pier stretching far out to the sea, where cargo boats carry a wide range of products and household items from the mainland in the early morning. 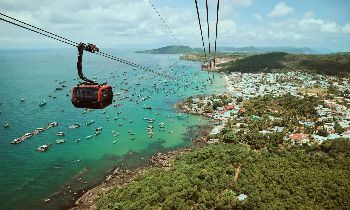 Travelers can come here to enjoy the beautiful sunset views of the colorful fishing boats, Ham Ninh mountain range and shoreline, and Hai Tac Archipelago in the distance. 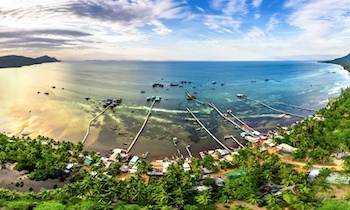 Ham Ninh Fishing Village is well-known for its unique seafood. It's a good idea to reach Ham Ninh Market to enjoy some stunning dishes such as cucumber soup, boiled flower crab or tram mushroom, etc. Suoi Tranh Waterfall which is four meters in height is surrounded by evergreen flora, natural caves, and stone pools. Coming here, the nature lovers can join the recreational activities such as camping, picnicking and bird-watching. It's also a good idea to hike leisurely on small walking paths through the jungle. Visitors can easily find various trees, flowers, and animals such as orchids, ginseng, mushrooms, birds and shrimps. If you are looking for something more adventurous, you can hike further up from the main waterfall zone, going along the 15-kilometer stream to reach the Grotto of Bats that houses the beautiful unique stalactites. Although Sung Hung pagoda has undergone two major restorations, most of its original architecture are kept intact throughout the years. With a peaceful ambiance, in the front courtyard full of Bodhi trees, there is a statue of the Goddess of Mercy standing in a lotus pond, and a holy house having a bronze bell with various sculptures and red lacquered boards with engraved texts. Standing at three stories in height, the main altar hall house three Buddha statues with the sophisticated paintings of Buddhism anecdotes and mythical creatures. The pagoda attracts not only the devotees but also international travelers. You are a nature lover? You are a sun-seeking traveler? You like to escape from the bustling modern life? 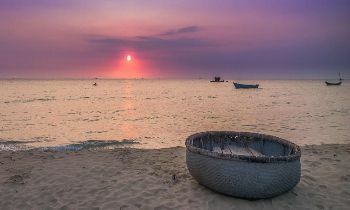 Phu Quoc is for you. Now you know where to go to Phu Quoc island. 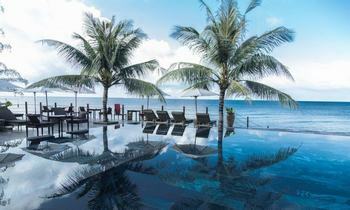 Do not hesitate to visit these above amazing spots when coming to Phu Quoc and have an unforgettable trip.